Which would you rather: money for jam? Or old style for new beginnings? 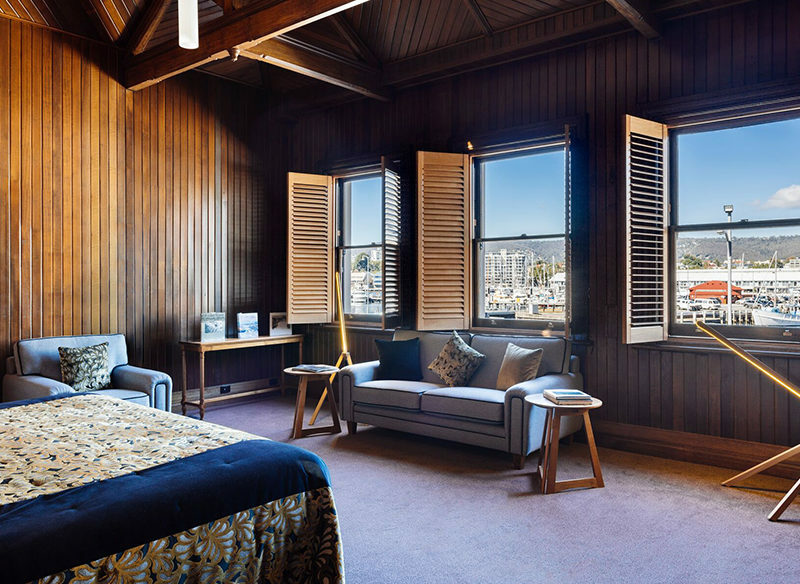 At Tasmania’s jaw-dropping Henry Jones Art Hotel, it’s possible to experience the lot . . . And some serious luxury and absorbing artwork besides. Where on Earth are we driving? What are we doing in the grimy industrial docklands of Hobart? This can’t be right. Oh, hang on, look: old stone buildings, a wonderful view over the harbour to Mount Wellington . . . a new area of the Hobart waterfront is coming to life, so trendy and “cafe”, so nearly bohemian. Foyer of the Henry Jones Art Hotel. Governor Collins chose this area in 1904 as the site of a storehouse for the new white settlement. At the end of the 19th Century, Henry Jones set up his famous IXL jams and preserves factory on the entire block, including this building. The fruit baron’s famous motto, “I excel at everything I do” (I excel. IXL. Get it? ), is an admirable one to aspire to. In the 20th Century the company was taken over by the inimitable John Elliot and broken up, the buildings left idle and derelict. But in 2004 the present consortium of owners opened the Henry Jones Art Hotel, which takes up a large section of the stone building, and to them, the famous motto lives again. In an inspired conversion, this boutique hotel of 50 rooms has breathed new life back into the old building. The charming rooms are wall-to-wall (literally) with architecturally interesting features: the original stone walls; the huge beams and posts displaying the wooden skeleton of the beast – it all has such an organic feel. I would’ve thought all this stone, tin and timber would be messy, and, at first, I was concerned about touching the walls. But as my partner pointed out, everything was sealed and completely free of dust. 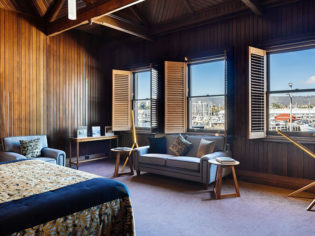 The Henry Jones Art Hotel houses an art collection of more than 250 original contemporary works by established and emerging Tasmanian artists, most of which are for sale and can be viewed in the catalogues available at reception and in every room. The art is displayed in the rooms and the public areas of the hotel and really is of excellent quality. I’m told it’s the only dedicated art hotel in the Southern Hemisphere. Jam Packed cafe at the Henry Jones Art Hotel. Bridging the gap between aged architecture and contemporary art is the choice of furnishings and additions, with hints of Indian and Chinese influence. From the bright silk bed covers to the modern timber cupboards, wide-screen plasma TV/DVD with high-speed internet and timber Venetians, the effect is eclectic modern. The bathrooms are glass-walled projections into the rooms, creating an area of diffuse light. The showers are huge and have double showerheads with ultramodern fittings. The wall-less shower is very hip – but if you’re a messy bather I wouldn’t leave my clothes on the floor, it could get a little swampy. The glass vanity bench is delightful and the modern dish-like sink is in the theme. I did hear a little whinge about the height of the sink and the inconvenience for shaving – which I concede. It is at a girly level, so it suited me. But the bathroom was great and the spa rooms have a good size spa – enough to indulge in relaxation or romance. The toiletries, herbal fragranced and in quaint little bottles, are unique – which I see as an important attention to detail. Downstairs, the IXL Long Bar is a comfortable place to have a drink before dinner in the Steam Packet restaurant at the heart of the hotel. The menu is interesting, with local seafood and a stylish mix of international flavours. The service is good and the staff pleasant. The Atrium, a three-story glass and timber structure within the hotel, is an alternate area where the restaurant serves meals. There are also cafes and retail outlets open seven days a week, plus an area for alfresco dining at the front of the hotel, with charming, protected tables on the walkway where views of the Derwent River and Mount Wellington inspire over sips of cappuccino. This area will surely develop over the next year or three as interesting shops and cafes open. I’m told a lot of the dockland industry will be relocating; it would be marvellous to be there one year when the Sydney Hobart yachts start arriving. Bathroom suite at the Henry Jones Art Hotel. The staff were wonderful, a real asset to the organisation. Actually, we found all the people of Tasmania to be friendly and welcoming. As we set off for our wilderness adventure, everyone we met was full of helpful information – and driving right across the island and hiking in the North West was an adventure I can highly recommend. But that’s a story for another time. Food at the Jam Packed cafe at the Henry Jones Art Hotel. Style: Old timber, new art. Location: Derwent River Tasmania, 18 mins from Hobart airport. Size: 50 rooms divided in to seven types. Outlook: Derwent River Harbour, Mount Wellington. Some Atrium-view rooms. Room Service: Yes. Very similar to the Steam Packet Menu for dinner, breakfast and lunch, with the addition of a night-owl menu. Available 24 hours. Disabled Facilities: Yes, two equal-access suites and access to all public areas. Fee: $210-$340. Great year-round packages available. Thumbs Up: Visually interesting, wonderful art, romantic. Thumbs down: Atrium rooms – too much light at night.